Persecution of Christians worldwide seems to be increasing. China is tearing down crosses. The Islamic regions either outlaw Christian evangelism (ex., Saudi Arabia) or are dominated by radical Islamists who seek to wipe out Christianity entirely. 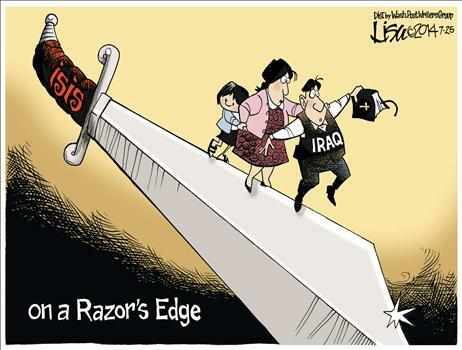 The poster child for this new persecution, sadly enough, is Iraq, where the U.S. has expended so much effort to turn that nation into a civilized ally. As the country falls apart, and sections of it are overpowered by the latest Islamist terror organization, ISIS, Christians are becoming nearly non-existent. Their new overlords lay out the options: either convert to Islam, pay a fine for “protection,” or leave. Those who refuse to bow to any of those options are executed. Mosul, a city that, until recently, had 60,000 Christians, now has none. Those that refused to leave were slaughtered. This is a new genocide, but not one that seems to get the attention it deserves. Rarely, in the mainstream media, is this a feature. 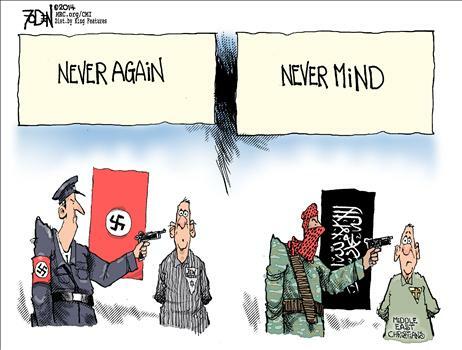 It’s the silent genocide, as far as the media is concerned. I can only imagine the joy she felt upon her release. 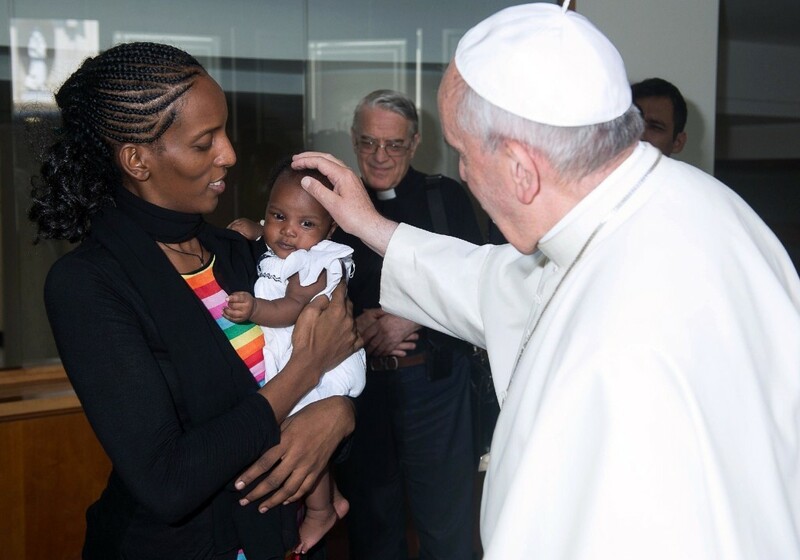 I pray she won’t find that type of persecution in her new home in America. However, that is not a certainty. While Christians in the U.S. are not told to renounce their faith, they definitely are starting to feel pressures quite alien to the history and tradition of the nation. Obamacare’s attempt to force Christian organizations to fund abortions is only the beginning. President Obama’s new executive order mandating so-called non-discrimination in hiring as it relates to homosexuals is another broadside against those who hold to a strong Biblical morality. That order specifically does not exempt religious organizations. Now, that only applies currently to those who want to receive federal funding in any way. I’ve always argued against Christian institutions taking federal funds, for fear it would lead to control over the message. Since all student loans are now coming directly from the federal government—an almost invisible change made in the early days of the Obama administration—all Christian colleges and universities may find themselves faced with a hard choice. What if the government refuses to give students any aid if they attend a college that continues to hire based on its Biblical beliefs, which includes viewing homosexuality as sinful? For me, the choice is not hard: we should never back down on the truth of God’s Word. Are we only a few steps away from outright persecution? This seems an appropriate spot to mention a movie that has come out recently that dares to ask that question. 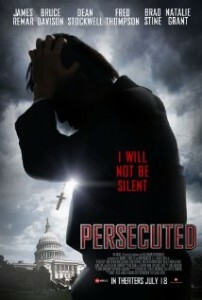 The title is simple and to the point: Persecuted. It’s fictional, but not far from what could easily become factual. A nationally known pastor is pressed by the government to come out in support of a bill that promotes “tolerance” of all beliefs. The catch is that it will mean a blurring of the line with respect to truth: no one can claim there is only one way to salvation. The pastor refuses to bend the knee and finds himself in a nightmare world of false accusations; he has to flee for his life. The film has a top-notch cast, which lends itself to fine performances all around. It doesn’t wrap everything up in a neat little box at the end, and it not only deals with government corruption but corruption within the Christian world also. I highly recommend seeing it before it disappears. It will make you think, and we are a point where God wants us to be thinking about what we would do if the movie’s scenario should become reality. I’m not a whiner. I believe God is able to lead us through trials and through outright persecution. My main concern is that we be ready to do His will, regardless of what we will face in the future. We need to be prepared.